Number of pages: 52 p.
Joy is a joyous, optimistic woman with a hart of gold. Luuk is moody, cranky and on the edge of losing his self-control. He is dangerous to his environment and the last thing he wants to do is harm Joy. But will you stay away from Luuk because of his cranky character? Or when she finds out that he is not human? Well look at that! A Dutch short story, one that will give you joy. Unlike Bring Her Wolf this short story actually has content. We learn about Joy and her habbits. We meet her peculiar client, Luuk, who happens to be a werewolf. The story builds up to a great ending too. Hopefully we will get to see a sequel to this short story, I would love to lear more about the characters! It would be even better if Evi could turn this into a full-length book! It definitely got the potential to be much more than just a short story. And I would be the first person to by the book! 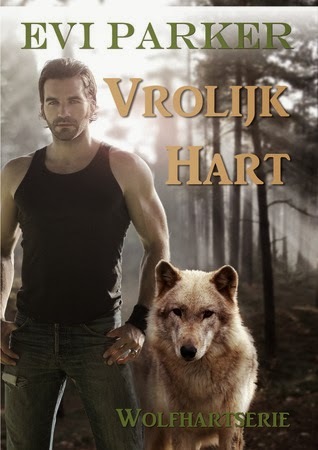 It is really great to read a Dutch paranormal romance. Most of the books on the market are translation from English writers, which I don't read in Dutch. The was a nice change from my overstuffed Engelish Kindle shelf. 4 snowflakes for this short story!